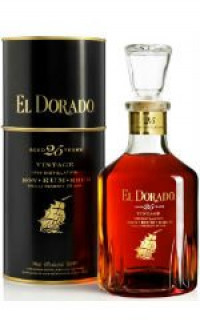 An extremely rare creation, this rum is rich, smooth and mellow with soft syrupy mouth-feel and subtle notes of caramel and heavy fruit cake. An after-dinner treat for sipping slowly and sparingly. An extremely rare creation and a rare experience to savour. Created to mark the turn of the millennium, 25 Year Old Vintage Reserve is presented in an appropriately distinctive decanter to treasure or to give with pleasure.